Marketers talk in buzzwords… we really just can’t help it. Today, let me explain one of those buzzwords: What’s a brand? – What a brand is. – What the power of a clear brand image is. – Why it is better to have no brand then an undefined brand. We don’t just write articles and record podcasts – we also publish books! 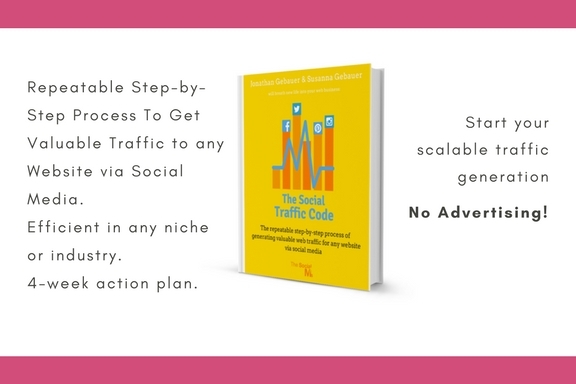 If you want to know exactly how to generate free traffic via social media, read our book, The Social Traffic Code. Marketing is our new podcast, hosted by me (Jonathan Gebauer at The Social Ms), and produced by my sister Susanna and myself. And we try to be different from other marketing podcasts – this is not going to be an interview show and it is also not going to be improvised. The show is heavily scripted and focused on explaining one marketing topic in each episode, always in under 10 minutes. We want you to be able to listen to this show and learn something whenever you have 10 minutes of free time. We know that your time is valuable! Does this sound like something you could benefit from? Then I hope you will subscribe to the show and return for the next episode!